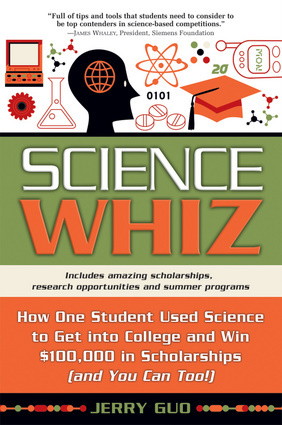 Jerry Guo is the author of Science Whiz: How One Student Used Science to Get into College and Win $100,000 in Scholarships (and You Can Too!). An undergraduate at Yale University, he is a freelance writer for Science, Nature, and The Scientist, a reporter at the Yale Daily News and the winner of more than $120,000 in scholarships. Jerry has worked in research labs at NIH, Caltech, and the Yale ecology department. Author Jerry Guo went from making the world's strangest kind of honey in high school to winning more than $120,000 in college scholarships. Now you can learn from his valuable experience and get invaluable advice on how to turn your passion into a ticket to a great education and fascinating career. Being a science whiz is your key to a free top-quality education and an amazing lifetime career. Lesson 14: How about Summer Camp? “This book has a plethora of helpful tips about conducting research as a high school student as well as making the most out of high school. Jerry Guo is a student who chased his curiosity, paved his own path through high school, succeeded and is now sharing his valuable insight with the world. Many opportunities that he suggested in the book— such as ‘study abroad in high school’ and ‘take advantage of free college classes’— were things that I never thought of in high school!